In the 50s Archbishop Fulton J. Sheen was not only a television personality, but one of the most watched and admired. What made Sheen so popular was his empathy and ability to place American experience within an understandable Christian context. Viewers heard words of encouragement and hope, spiritual promise and happiness instead of the hellfire-and-brimstone focus on sin and damnation they heard from Catholic pulpits. Protestants too found Bishop Sheen’s messages of simple, attainable spirituality appealing and far from the demanding, censorious, commandments of righteousness, grace, and self-abnegation they were used to. Sheen talked of faith simply but without patronizing his audience. He used familiar metaphors and storylines; an eloquent but common language; and a media-ready personality to connect with his audience. His delivery was confident but warm; and his words were comforting and encouraging. Some people live in such a way as to have all their moods determined by what happens to them in the world. They are sad when stars take up their encampment on the battlefield of night; and they are gay in morning's eyes. When there is rain on the cheek of nature, often tears bedew their own cheeks. What happens at the bargain counter, in the office or in traffic; the poisoned arrow of sarcasm, the overheard slur and the whining of children, so often make and mold our moods, that like chameleons we take on the color of the experience that presently imposes itself on us…The condition of a happy life is to live so that the trials and vicissitudes of life do not impose their moods on us. Rather, we become so rooted in peace and inner joy that we communicate them not only to our surroundings, but also to others…Some radiate cheer and happiness because they already have it within them, just as some seem to have ice on their foreheads, making winter all the year. The problem is how to possess this inner constancy of peace which makes the depths of our soul calm, even when the surface like the ocean, is ruffled or mixed with storms or cares. The best way is prayer. Father James Coughlin was an earlier version of Archbishop Sheen. Coughlin first aired his radio broadcasts in 1926 in a program that was a simple, even humble talk-radio program that dealt with issues of American living, religion, touch of politics. For five years, Coughlin delivered a weekly show to many listeners. Coughlin was soon forced to raise funds for his radio show once CBS dropped their free sponsorship of the program in 1931 but in only one year is listenership counted millions of listeners. His show peaked during the early 1930s; and at the time, his broadcasts were some of the most popular in the country, drawing in millions of viewers and receiving upwards of 80,000 letters per week. His popularity rapidly declined, however, when criticisms, especially from Catholic colleagues, focused on his extreme political views. What had started as simply homilies became right-wing screeds. In 1935, Norman Vincent Peale, a pastor, television and radio personality and prolific write was as well-known as Archbishop Sheen and Father Coughlin, and his message, The Power of Positive Thinking, was a similar, although more secular vision than that of his Catholic colleague. Peale started a radio program, "The Art of Living", which lasted for 54 years. Under sponsorship of the National Council of Churches he moved into television when the new medium arrived. In the meantime he had begun to edit the magazine Guideposts and to write books. His sermons were mailed monthly. His homilies were as simply presented and as hopeful and encouraging as Sheen’s, but lacking the Archbishop’s simple but elegant language. His messages, however, were in many ways even more appealing because they required no specialization – not religious doctrine according to which secular aspirations could be oriented. Sheen never hid his Vatican appointment nor his surplice. Jesus Christ and the teachings of the Church, no matter how carefully interwoven within his homilies, were always present. Peale understood that his widest reach could be achieved through secular possibility spoken by a religious man. Be so strong that nothing can disturb your peace of mind. Talk health, happiness, and prosperity to every person you meet. make all your friends feel there is something special in them. Look at the sunny side of everything. Think only the best, be as enthusiastic about the success of others as you are about your own. Forget the mistakes of the past and press on to the greater achievements of the future. Give everyone a smile. Spend as much time improving yourself that you have no time left to criticize others. Be too big for worry and too noble for anger. While Catholic television personalities are no more, Protestant televangelists are more popular as ever. Billy Graham is perhaps the best known, and at the time of his recent death, he managed a large media empire whose outlets recorded and rebroadcast his evangelical crusades As of 2008, Graham's estimated lifetime audience, including radio and television broadcasts, topped 2.2 billion. One special televised broadcast in 1996 alone may have reached a television audience of as many as 2.5 billion people worldwide. He combined secular, inspirational messages (“The greatest legacy one can pass on to one’s children and grandchildren is not money or other material things accumulated in one’s life, but rather a legacy of character and faith”) with more clearly Christian evangelical ones (“Suffering is part of the human condition and it comes to us all. The key is how we react to it, either turning away from God in anger and bitterness or growing closer to Him in trust and confidence”). His popularity was enhanced by his friendship and acquaintance with presidents, rock stars, and movie celebrities. While many criticized him for what they considered his groupie aspirations, they could not deny that he was a canny marketer and public relations genius. 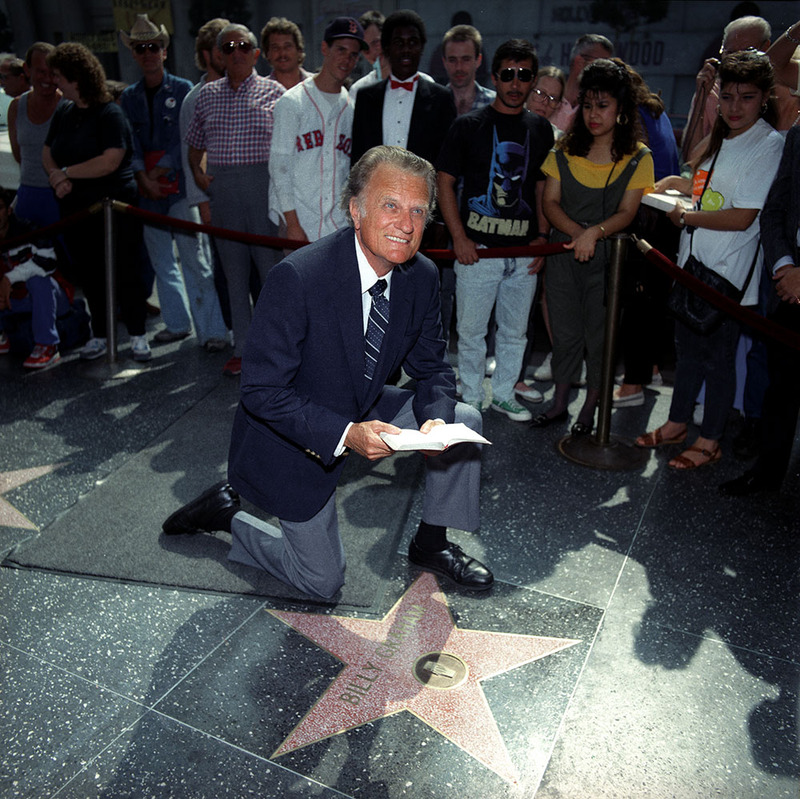 ‘Billy Graham’ became synonymous with virtue. Later televangelists like Jimmy Swaggart, Jim Bakker, and others sought the same celebrity but fell off the moral rails that Graham had so carefully ridden. Their emotionalism and drama gave their fundamentalist messages a certain popular power; but it was short-lived. Others hew closer to the Billy Graham model – media savvy performers combining popular secular and traditionally Christian messages. Tony Robbins is perhaps closest to Norman Vincent Peale because of his focus on positive thinking, can-do Americanism, and a belief in individual enterprise within a Christian community. Americans have a seemingly insatiable need for spiritual and personal validation. Religion has moved out of the canonical into the popular. The complex metaphorical messages of Christ, the sophisticated theology of the Early Church and the mysteries of divinity, trinity, resurrection, and salvation are all but lost in the simplified, popularized interpretations of them. Martin Luther’s revolutionary and sophisticated doctrine of grace, a fundamental shift away from the Vatican-mediated, clerical Catholic way to salvation, is still alive and well; but from evangelical pulpits is reduced to its most elemental form. Aspirants are asked only to form a personal relationship with Jesus Christ, take him as their personal savior, believe in him unequivocally, and pray for salvation. There are no rules of practice, no reins on personal interpretation or expression, no dictates from a central authority. As a result, the share of fundamentalists as a proportion of all Protestants keeps growing. They represent a new paradigm in religion, one far from the roots of traditional Methodism and other mainstream churches, and one which is more attuned to American popular culture, an ethos of individualism, and a love of celebrity (Jesus Christ Superstar). Evangelicals are only the avant-garde of this popularization of religion in America, and most believers will eventually follow. Religion has become easy, freer from dogma, ritual, and doctrine than ever before. Priests and pastors are more than ever descendants of Archbishop Sheen, Father Coughlin, and Billy Graham. Pope Francis has made it clear that the Church can no longer remain the archaic, behind-closed doors, secretive, insular institution that it has always been. It must popularize and stay relevant. Francis himself has become somewhat of a media celebrity, feeling like preachers before him that any exposure is a good exposure when the word of Christ is the issue. It is no surprise that this new, popularized form of religious expression is expanding through all denominations in America. Supporters claim that it represents the democratization of religion. No longer should one be ruled by the College of Cardinals, the Pope, or the anointed prelates of the Church – old men with old ideas, patriarchal at worst and obedient at best, but supernumerary in today’s flexible, porous, and relaxed world. Perhaps most importantly, one’s faith can be easily validated. Believing is easier than it ever has been. Similarly, ones self-image and self-esteem can be validated by the feel-good, supportive words of Robbins and others who preach a highly personal form of goodness. Sheen, Coughlin, Graham, and hundreds of other revivalists, televangelists, inspirational speakers, and ecstatic preachers who have been icons of America for a hundred years if not before have left a living legacy. It was not so much that they influenced Americans’ form of belief. Americans were ready to be freed from cant, liturgy, and authority.